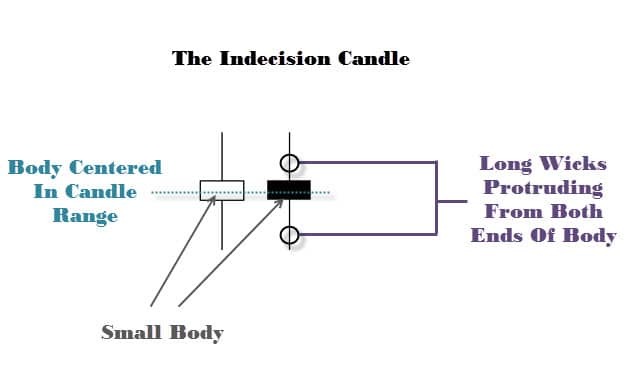 One of the powerful candlestick signals we use in our price action trading system is called the ‘Indecision Candle’. 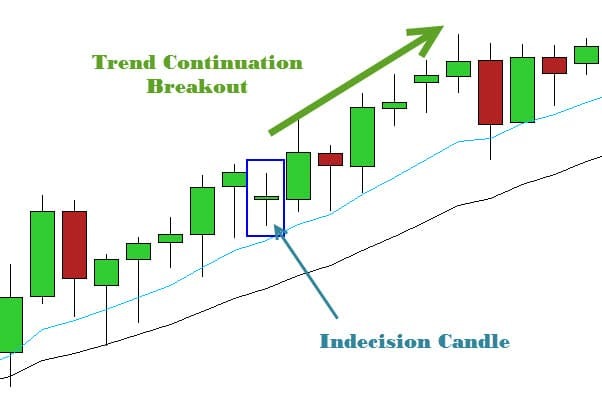 In this article we are going to go over what qualifies an Indecision candle, and why they are an extremely useful tool to have in your price action technical trading arsenal. You may have heard, or come across the other common names like the “doji” and the “spinning top”. While there are some many rules out there which defines what the setup should look like, we have unified them into a less confusing, generic signal called the ‘indecision candle’. The reason for this is the Doji, and spinning top are extremely similar in structure. 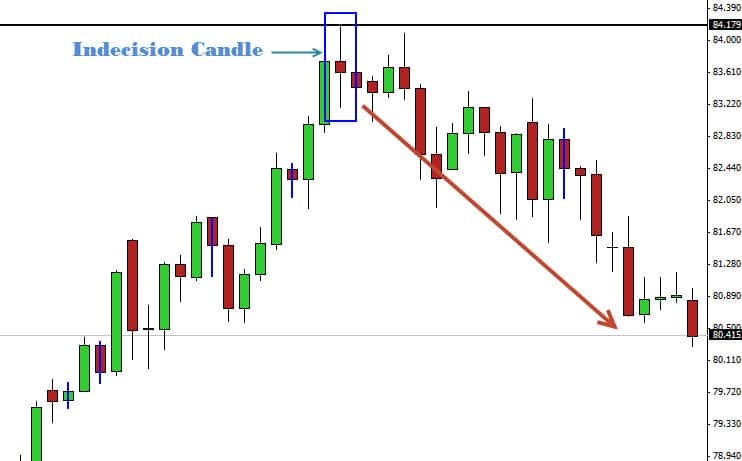 The wicks protruding out each side of the candle communicates to the trader that price has tried to move both up and down during that candles trading session. The market was unsuccessful in maintaining either higher or lower prices giving this candlestick pattern it’s distinctive anatomy. The wicks poking out either side of the candle body are the tell tale signs of this up and down movement. What does this tell us? It tells us price action traders that the bulls and the bears were very active during the session, fighting against each other. Because there was no real winner by the end of the candles session, the market closes roughly in the same area as it’s open price. This type of behaviour clearly demonstrates indecisiveness, hence the name indecision candle. Indecision candles can often be found at the tops and bottoms of trends. They form because price will run into a major reversal area on the chart, like a weekly support or resistance level, and orders flood into the market as money exchanges hands. The high order volume creates a lot of buyers and sellers, the large amounts of money being exchanged between the bulls and the bears creates the ‘whipping’ up and down motion which forms the indiecision candle structure (the upper and lower wicks). The general rule of thumb is, the longer the consolidation, the more powerful the breakouts are. Notice how the Indecision Candle stopped the trend dead in its tracks and completely caused price to stop & reverse. The bulls were driving price up the chart right into a major resistance level, where sellers kicked in. A frenzy of orders enter the market as buyers and sellers participate in the market heavily at the important price level. This battle between the bears and bulls left behind this indecision candle formation on the chart shown above. Eventually the resistance level held strong and price action traders were able to position into a bearish breakout, before it actually happened.. This is why Indecision candles are definitely a must have for the keen price action trader and work fantastic when combined with swing trading strategies. Not only are Indecision candles good for reversals signals, they can also act as good price continuation signals. Remember, the indecision candle structure represents uncertainty in the market, the indecisive price behaviour halts price movement in the market. One of thebenefits of price action trading is you can catch the breakout when the market decides which way it wants to go when it starts moving again. So as you can see this indecision candle provided a good opportunity for the trader to jump in on this bullish trending market. Now you can see how powerful the Indecision candle can be when traded correctly. Be careful though, you will find indecision candlesticks forming all over the charts. Unfortunately not every single one of them are good trading opportunities. Take caution when selecting your trade, make sure you back up the trade with good reasoning and understand how to enter a forex trade correctly.